The Sweet Potato Pie Factory & More is located at 171 Dr. Samuel McCree Way. Large pies run $9.50, small pies are $4, and tarts are $1.50. A typical dinner consisting of a meat and two sides costs $9. Restaurant hours are Thursdays and Fridays from 11 a.m. to 6 p.m. and Saturdays 11 a.m. to 7 p.m. (hot food service ends 40 minutes prior to closing). Calling ahead at 434-4054 is recommended. Alberta Jacque presents a tray of fresh pies at Sweet Potato Pie Factory & More. In his 2012 song "Hood Now (Outro)," Lupe Fiasco raps: "They gave us scraps, some of it old/We cooked it up and called it 'soul'/It's good now/It's good now/You like that?/It's hood now." Historically speaking, that's soul food: Plantation owners forked over the chaff of the table to their slaves. Tough ham hocks, coarse collard greens — food that took a long time to cook down. The song lists American cultural treasures that began as exclusionary moves against the black population, only to be repurposed into gold. But according to Victoria Lang, one of the owners of The Sweet Potato Pie Factory & More in Mayor's Heights, the definition itself has evolved. "Soul food is the food that your mother — that meal she prepared and it took her some time to prepare it because she was putting love into that food, that's labeled soul food," Lang says. "She put love into those greens, that macaroni and cheese, the dressing, which goes back to a saying you hear a lot around Black people: She put her foot in it. That means it's so good." 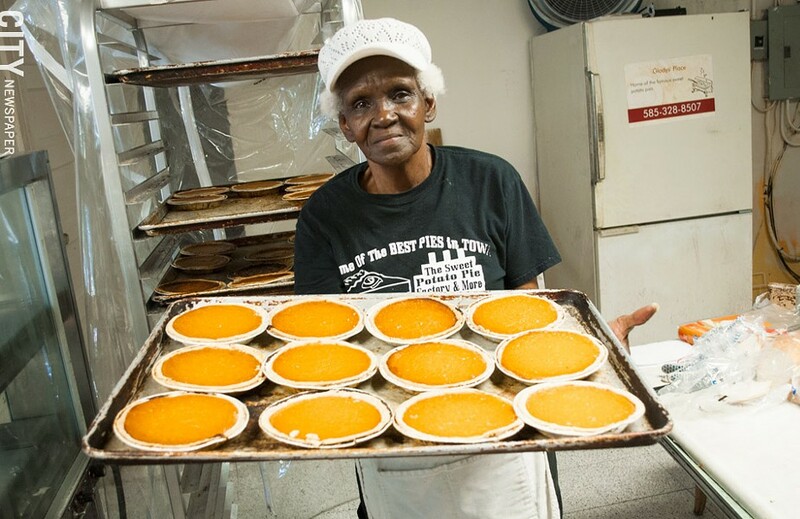 The Sweet Potato Pie Factory & More — formerly Gladys Place, previously The Kitchen, and before that, Burke's Kitchen — started as a sweet potato pie and soul food stand on the side of the House of God Church. It is the oldest soul food restaurant in Rochester. Gladys Burke turned 93 on July 13. Two years ago, Mayor Warren personally honored her by proclaiming July 13 Gladys Burke Day in Rochester. The certificate presented on that day recognizes her contributions to the community, "A personal journey lasting over 40 years of providing sustenance to the souls in the community through church ministry, as well as 'soul food,' and hospitality to (her) neighbors." As far as the certificate is concerned, that journey started at the church, where Gladys' husband was pastor. But the story goes back farther than that. "My mother was a great cook," Gladys says. The recipes devoured today at the restaurant on Dr. Samuel McCree Way were carried north from a flyspeck Alabama town in 1951. Gladys was the eighth of 22 children. 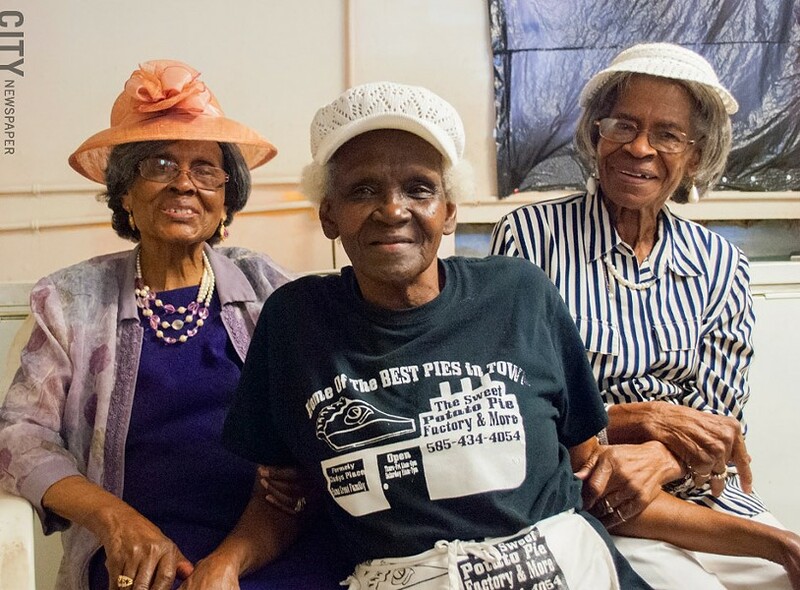 She grew up among a thick network of extended family: "Children, grandchildren, great grandchildren, and probably some great great grandchildren, and we were noted for doing sweet potato pies," she says. Left to right: Gladys Burke, Alberta Jacque, and Bertha Israel. One of her early culinary companions was her niece Alberta Jacque, who today can be found behind the counter at the restaurant taking orders, and giving them. On a recent Saturday afternoon, she wears a white knit hat and addresses a customer ordering the signature pie. He is trying to customize his order. "My mother used to burn them," he says. Jacque, 78 years old, shoots him a glance. "Trouble is, I'm not your mother," she says. The appearance of the restaurant is straightforward. There are several wooden chairs for waiting customers, a large posted menu, and a framed picture of Barack Obama. These recipes, much like their ingredients, have been simmering a long time. Window dressing isn't necessary. "My mother wasn't as pretty as you," the customer says to Jacque, taking his unburned pie. "If I like the pie, I'll be back." "I guarantee you'll be back," Jacque says. 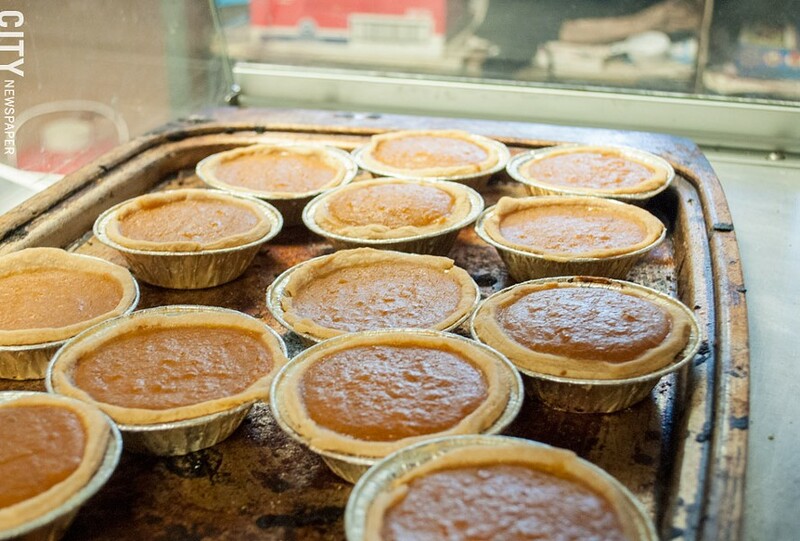 Mini pies at Sweet Potato Pie Factory & More. In the adjacent kitchen, Harry Jacque Jr., Alberta's son, rolls dough on the counter with a wooden rolling pin. The key to perfectly thin crust, he says, is to stop rolling as soon as he starts to see the counter through the dough. The crust on the pies is a sweet, flaky wafer. It gives upon contact with your teeth, letting loose the sweet potato filling, often warm from the oven. The flavor, at first, is reminiscent of pumpkin pie, full of autumnal spice, but then the higher, sweeter notes of the potatoes come out. The busiest time for pies by far is Thanksgiving. "Harry, last Thanksgiving how many pies do you think you sold?" Lang calls across the kitchen. "Seven hundred and something pies, he answers. "The large ones, that's not counting the smalls." Lang said they also typically get a rush from people on the way to the airport, after the holiday winds down, and that they have shipped pies as far as Seattle. A couple at the counter call across the room that they come regularly from Niagara Falls for the pies. With such pie-based adoration flowing into the Sweet Potato Pie Factory & More, it's easy to forget the "& More." That would be a mistake. The full menu features fried chicken, fried fish, turkey wings, beef ribs in a homemade barbecue sauce, fresh collard greens cooked with smoked turkey, black eyed peas, macaroni and cheese, cornbread dressing, and more. Many of these offerings are prepared by Jacque herself. "My cousin is special, man," Lang says. "Watching people eat the food she cooks is just joy to her." Between the two of them, Jacque and Lang share the wealth of stories belonging to any large family that's known happiness and hardship: Picking cotton as sharecroppers in Alabama; the advice to only buy raccoons for cooking if they still have feet, so you know it's not actually a dog; the uncle who served in World War II and insisted he killed seven Nazi captors with a single bullet; a different uncle who jangled silver dollars in his pocket and so was nicknamed Uncle Money. And of course, every recipe on the board. For visitors to the restaurant, collard greens and cornbread dressing are unmissable. Although greens are usually cooked with ham hocks, the restaurant serves no pork products — a custom held over from the House of God, which Lang says forbade the consumption of pork. In this case, the ham isn't missed. Briny, deep rolling earth flavors smack with salt on every forkful. The dressing likewise is all flavor: Thanksgiving dressing but with the pleasant grit of cornmeal. The fried chicken crust gives way to juicy, tender meat inside and the turkey wings are satisfyingly greasy. Lang's mother, Bertha Israel, is Gladys' younger sister, and her specialty during the early days of the restaurant was cake. These days though, like her sister, she's leaving most of the day-to-day work to the younger members of the family. "It's the world and all to me," she says. Gladys agrees. She bequeathed recipes not just for pie and greens, but for hospitality, family, and togetherness. "So now," she says, "I done cooked out." Dining Reviews Soul Food series soul food Sweet Potato Pie Factory & More Mayor's Heights Gladys Burke Alberta Jacque Bertha Israel Victoria Lang Harry Jacque Jr.